April 10, 2014, 10:22 AM · Violinist Nigel Armstrong will perform this weekend with the American Youth Symphony at UCLA's Royce Hall in Los Angeles, as part of the Symphony's Alumni Project. He was the group's concertmaster from 2009 to 2011. It might be one of the last opportunities to hear this excellent young violinist before he goes on a hiatus of undetermined length. In December, Armstrong, 24, turned in the Scarampella violin he'd been borrowing. "I don't have any concerts planned past May, and I'm planning on exploring a bit of the Buddhist monastic life this summer," said Nigel, speaking with me over the phone on Tuesday from Boston. 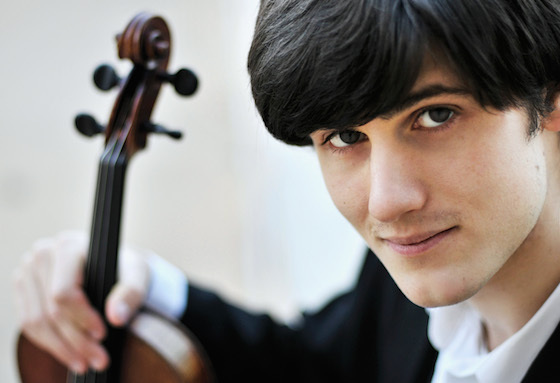 He's worked intensely on the violin for an extended period of time: studying four years at the Colburn School followed by two at the Curtis Institute; performing as a soloist with numerous orchestras; and winning awards international competitions, including the 2010 Yehudi Menuhin International Violin Competition and the 2011 Tchaikovsky Competition. "…As I embark on my post-school years," he wrote on his Facebook page in March, "I'd like to move in a direction in which I'm able to find peace within myself. And, by doing so, to be able to share it with others." This summer he plans to spend some time at Plum Village in France, a Buddhist practice center in a Vietnamese Zen tradition. Will he return to the violin? "Possibly, if I feel like I can do so in a way that I feel is fundamentally positive, in terms of what I'm doing, not just in terms of what I'm playing, but in terms of how I go about my life that supports that playing," he said. Written by John Corigliano especially for that 2011 Tchaikovsky Competition, "Stomp" has became a go-to showpiece for Nigel, who not only mastered how to negotiate the scordatura violin and foot stomping required by the score, but also added his own dimension of complexity by playing a portion of it with the violin behind his back. For the piece, the E string is tuned to E flat, and the G string is tuned down a minor third to an E, so the strings from bottom to top are E-D-A-Eb. When he played it for the first time at the Tchaikovsky Competition in St. Petersburg, "the judges were up on a balcony, and then the rest of the audience was in the main level," Nigel said. "I remember looking out, when I put the violin behind my back, and a lot of people were craning their heads backwards, to see what the judges were thinking!" Apparently they were thinking good things: Nigel was awarded the Best Performance of the Commissioned Work for his performance of "Stomp." But what made him take that crazy risk, the behind-the-back stunt? "When I got the score for 'Stomp,' Corigliano had written a very nice note for performers on the introduction page, before the music starts. It gave some Youtube references, to give an idea of what the stomping would be like and what the style would be. Then he ended by saying: 'I hope you have as much fun playing this piece as I had writing it' -- and that got to me a little bit. I forget when the idea struck me, but soon thereafter I was thinking about maybe working in something, like putting the violin under my leg, behind my back, or something nontraditional, something more fiddle-like, in the performance. I experimented with a few different things, but I thought the best place (for something non-traditional) would be this place in the middle (of the piece) and the easiest position for me to get to was behind the back, so I started practicing that." Nigel still enjoys playing fiddle and jazz, and in fact "I'm doing a couple jazz recitals in the Central Valley, the weekend after this next one," he said. And which jazz and fiddle players does he most admire? One of his favorite recordings is The Goat Rodeo Sessions, with cellist Yo-Yo Ma, bassist Edgar Meyer, Chris Thile on mandolin and Stewart Duncan on violin. "I really enjoyed that CD," he said, and while playing with a fellow Curtis student who was a bassist, he had the opportunity to take a few lessons with Edgar Meyer. "It was great to get to know him a bit. It's really imaginative, what he and that group has done, taking the traditional feel for music and bringing so much creativity to it, and seeing where it can go. One of the tracks on 'Goat Rodeo Sessions' is called '13-8,' -- it has these very complex meters, yet it retains this kind of fiddle feel." Nigel, originally from Sonoma, Calif., started playing the violin when he was five and a half, after asking for lessons for about a year, he said. "My first teacher lived across the street, and I would hear her students playing, and also my mother played a bit in the house," he said. He started with Suzuki lessons, then went on to study with Zaven Melikian in San Francisco, Robert Lipsett at Colburn, and Arnold Steinhardt and Shmuel Ashkenasi at Curtis. Competitions have provided a wonderful way to see the world, he said. "A lot of these competitions pay for people's travels and put people up," he said, "so you can, as a young musician, visit many different places all over the world." When he played the Menuhin Competition in 2010, it was in Oslo, Norway. And the Tchaikovsky, of course, took place in St. Petersburg, Russia. "That's been my only time in Russia, and getting to know St. Petersburg -- it was wonderful. The first three rounds were held in the Glazunov Hall at the St. Petersburg Conservatory, and everything is light and larger-than-life: the walls, the organ, and beautiful fresco ceiling on the top, and then on one side they have these almost floor-to-ceiling length windows. Because it was in June, people would be playing recitals that ended at 10:30 or 11 at night, and there was still sun streaming in! It was really beautiful to be there." Another way he has explored the world has been through language: in addition to English, he speaks French, German, and some Chinese and Spanish -- and just a bit of rudimentary Italian and Korean. "What I find fascinating about language is the light it sheds on how we think and how we communicate," he said. "I see speech as a type of improvisation. It rides upon these thoughts we have, which are translated into these words that come out. It also works the other way, in that we learn to have certain thoughts or see things in a certain way because of the words that we use." Though he has had many successes as a soloist, he also greatly enjoys orchestra playing. "What I love about orchestra playing is the ability to be part of something so grand, so wonderful," he said. "The composers who wrote for orchestra had so many colors at their disposal. Some of my most profound, my most powerful moments as a performer have been being part of an orchestra, playing pieces like Beethoven Nine, which I played with American Youth Symphony, or being part of a Brahms Symphony -- I love the ending of Brahms Symphony No. 2. To take part in some of these grand, expansive pieces, to be a member of this huge instrument, it's really thrilling." April 10, 2014 at 10:39 PM · Just another utter genius.